One pair of medium weight 28 inch Palasans with a carry case. All you need to get started at a discounted price! 1 pair of medium weight 32 inch Palasans with a 32 inch carry case. Buy together at a discounted price! 32 inch stick and bag kit. 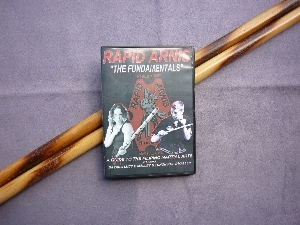 Made from a tough rattan cane known as Palasan, these Eskrima Kali Arnis sticks are used for those who require a harder impact from their training with more durability. 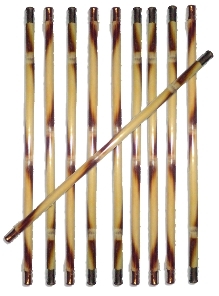 Directly imported from the Philippines and made by a Grand Master the Palasan stick skins are left intact and are specially treated using traditional methods with herbs during the hardening process to make them the tougher rattan stick. We believe these sticks by Eskrimador Supplies to be the best all round stick on the market. Available in 28 inch for this deal. Approx weight 160 to 230 grams each. Approximate diameter 22mm (7/8 inch).This is a natural product therefore size and weight may vary. Please also see our note regarding price increases on the 'Product News' page. instructors Tuhon Pat O'Malley & Dayang Lucy O'Malley. Exactly as above but with the addition of a stick bag for the sticks!! 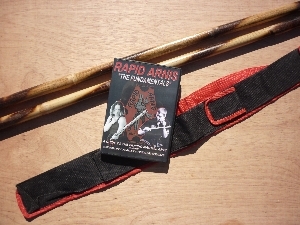 1 Rapid Arnis DVD, one pair of Palasan sticks and one small stick bag. Exactly as above but with the addition of a JKD/Kali dagger as well! 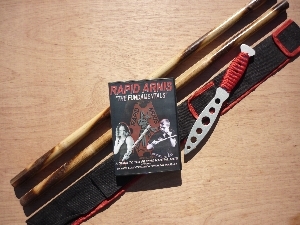 1 Rapid Arnis DVD, one pair of Palasan sticks, one small stick bag and one Polished Aluminium JKD / KALI dagger. Dagger will have black handle, not red as shown.